Here are Top Santa Letters, our main priority is you, our customer. We’ve spent years creating our letters and gift items and have perfected every single aspect before putting our name on it. We believe in high quality products that create memories for a lifetime at an affordable price. We know how special the Christmas season is for children, friends and family and we hope that our letters and gifts add some Christmas magic to your life! We know that any child who receives our package or letter from Santa will cherish it’s arrival and contents for years to come! 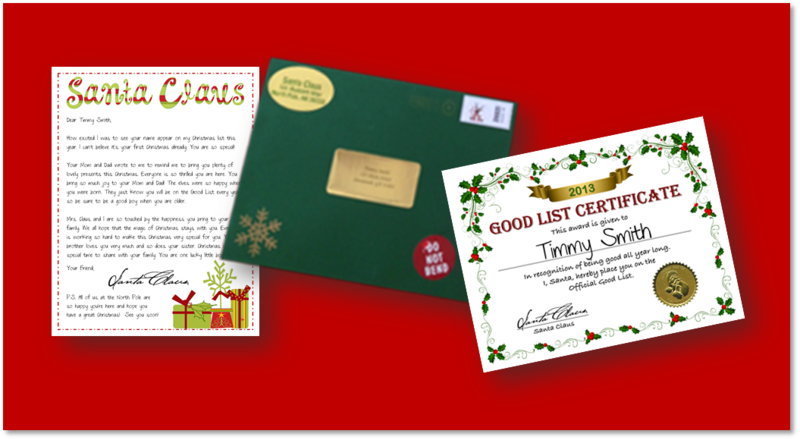 Make this Christmas extra memorable with our personalized Santa letters or Gift Packages from Santa. NEW! 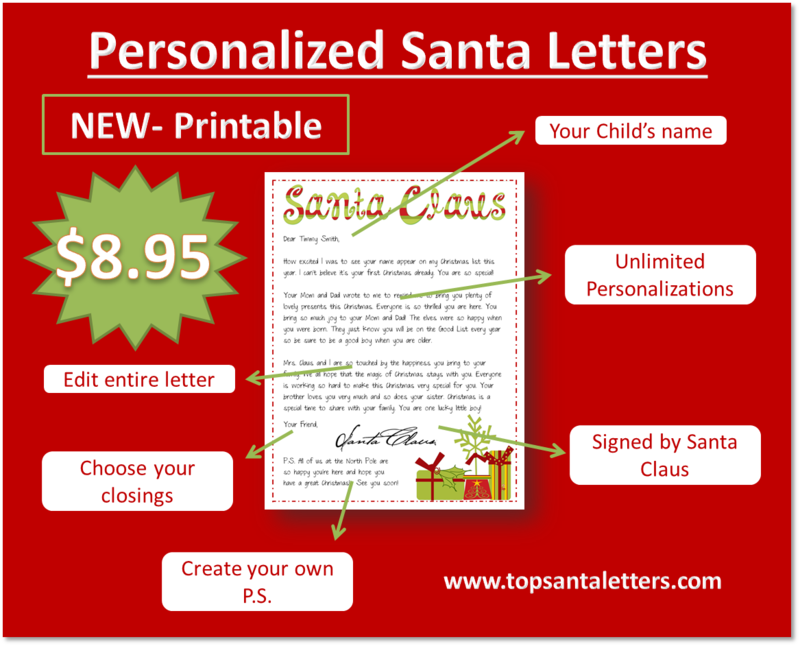 Printable package- Print at home a personalized letter from Santa! NEW! See a preview of what your REAL letter will look like- an exclusive for Top Santa Letters. NEW! Order for more than one child in a single transaction – another exclusive for Top Santa Letters. NEW! Order items individually- yet ANOTHER exclusive for Top Santa Letters. Order easily with our Unique Letter Creator Process™ which allows you to be in control every step of the way. All templates and letters are custom designed and one-of -a -kind. Entire letter can be edited, creating a truly unique letter for each recipient. You can choose the closing and create the P.S. of each letter. Choose from many letter templates including a Baby’s First Christmas letter, Religious letter, Classroom letter, and many more! Spell check is available for all letters. Each letter is signed by Santa. Addressed to your child in gold labels. Shipped in a green or red envelope from Santa Claus himself.